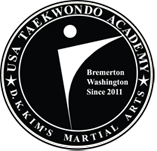 USA Taekwondo Academy in Bremerton offers a full line of classes for adults and children as well as family classes which allow parents to learn Taekwondo alongside their children. 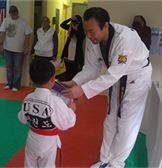 Taekwondo is one of the most popular martial arts in the world. It is a highly developed craft which focuses on physical movement, as well as spiritual balance. It serves as a practice which ultimately improves all aspects of our lives. Taekwondo is a Korean martial art and the national sport of South Korea. In Korean, tae means "to strike or break with foot"; kwon means "to strike or break with fist"; and do means "way", "method", or "art". Thus, taekwondo may be loosely translated as "the art of the foot and fist" or "the art of kicking and punching." As many other arts, it combines combat techniques, self-defense, sport, exercise, and in some cases meditation and philosophy. In 1989, Taekwondo was claimed as the world's most popular martial art in terms of number of practitioners. Gyeorugi, a type of sparring, has been an Olympic event since 2000.